The eyes are one of the first things people notice when looking at someone, so it is no surprise that eye bags are one of the most common complaints when a patient visits a plastic surgeon. As eye bags tend to make the patient look tired and listless, removal of the ‘bags’ can rejuvenate the patient’s face by making them look fresh and younger. 1. Patients with true excess of eye bag fats, with no other signs of midcheek aging: These patients are generally below 40 years old. 2. Patients with eye bags and associated with midcheek aging: These are generally patients above 40 years old. 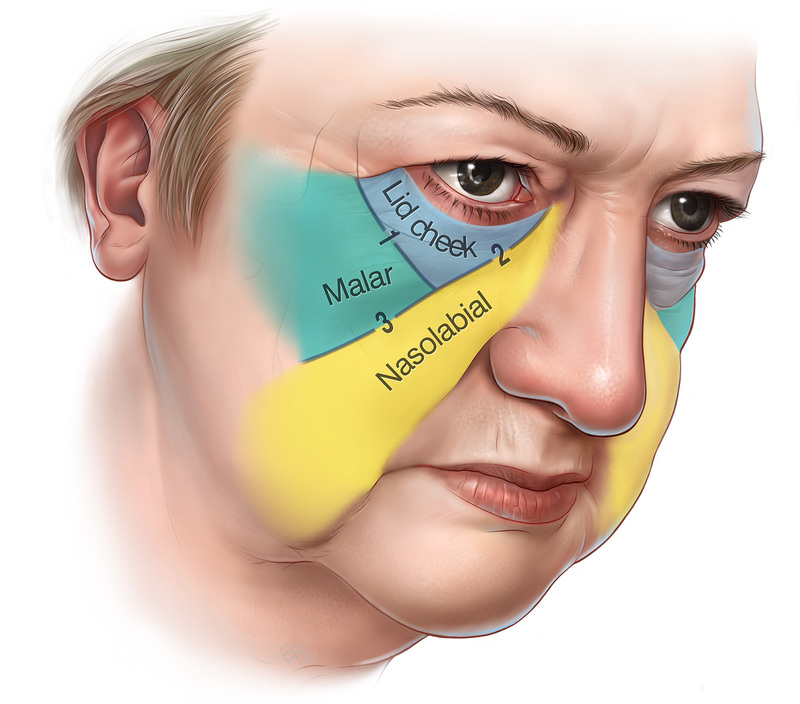 In patients with true excess of lower eyelid fats or bags, this can be removed from behind the eyelid via a small incision (about 1 cm), called the transconjuctival approach. 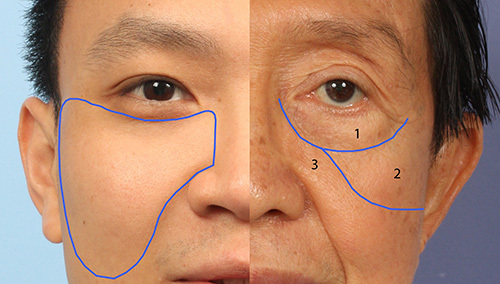 This technique is very effective in patients with eye bags, without other problems of midcheek aging. As the procedure does not involve cutting the skin from the lower eyelid, this technique is also called scarless eye bag removal. If the procedure is carried out on appropriately selected patients, it is profoundly rejuvenating. As it is done through a small incision, recovery is rapid, bruising and swelling minimal and potential complications very low. In patients with mild midcheek retrusion, augmenting the midcheek (with fillers and fat grafts) will deliver better results than merely having the surgery alone. In general, fat grafting or fillers to the midcheek can be done either at the same time as the operation or 2 weeks after the operation. Eye bags are one of the most common cosmetic concerns patients tend to have. As patients request for their eye bags to be removed, excision of the orbital fat pads that is responsible for the ‘bags’ has been the most common procedure for many years. While the fat excision or removal approach is still valuable and valid in selected patients, it may not be the best solution for many others with eye bag problems. Figure 1. Eyebags have the visual effect of making a person look tired. A fresher, more vibrant looking you. Let’s take a look at the deeper concerns of patients with eye bag problems, recent advances in the understanding of the anatomy of the aging midcheek (of which the eye bags is part of) and the elements needed to achieve optimal midcheek rejuvenation. Figure 2. Segmentation of the midcheek into 3 segments with the aging midcheek. First, lets consider what the patients are really seeking beyond correction of the eye bags. While the eye bags are quite noticeable, often what bothers the patients most is losing the ‘fresh look’ that they once had in their youth Looking ‘tired’ makes them appear to lack vitality even though they maybe full of energy inside. This can be attributed to the complex changes of the midcheek as we age. At a deeper level, these patients are actually seeking rejuvenation of the midcheek for a fresh and youthful look. Most importantly, the eye bags are only one aspect of the aging midcheek, and addressing the eye bags alone is inherently limited by what the approach can achieve. As such, all aspects of the aging midcheek have to be addressed to achieve the highest level of rejuvenation. The aging midcheek comprises several components, one of which is the bulging of the orbital fat that is commonly known as eye bags. This is also perhaps the most noticeable change that comes with aging. Figure 3. In youth the midcheek is full and rounded with no eyebags (left side). With aging, the midcheek segments into 3 segments with deflation and sagging clearly seen (right side). Equally important is the portion of the cheek, immediately below the eye bag. The soft tissues here tend to deflate and descend with aging, and this is particularly obvious in the inner aspect of the midcheek. Another significant change is the retrusion or resorption of the midface skeleton. This contributes profoundly to the loss of soft tissue support for the aging midcheek. Finally the skin thinning and fixed wrinkling all also play a role in the appearance of the aging midcheek. In particular, deflation is an aspect of the aging midcheek that is increasingly recognised as an important contributory factor. One only has to observe the fullness in the midcheek that is so evident in youth to appreciate the importance of volume restoration in midcheek rejuvenation. A recent anatomical advance is the understanding of the facial retaining ligaments of the midcheek. 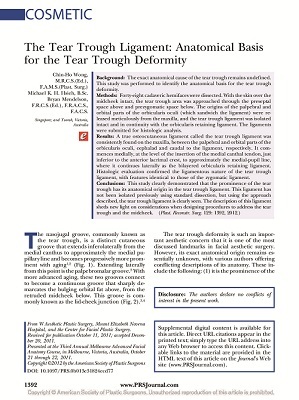 In this article, Dr Wong and colleagues described the tear trough-orbicularis retaining ligament complex, the key structure that holds the midcheek soft tissues. Utilizing this anatomy, midcheek lift can effectively and safely be done. The retaining ligaments are discrete fibrous structures the bind the tissue layers together. It is because of its function that it manifest as the surface grooves we see with aging. A prime example of this is the tear trough below the eye bags. Precise release of these ligaments can effectively soften these grooves, playing an integral part in rejuvenation of the midcheek. By understanding the factors that contribute to the tired look, we can then design procedures to address this issue and the components of the aging midcheek. When it comes to conventional eye bag surgery, excision is often the prescribed solution for patients with eye bags. While fat excision alone is effective in selected patients, especially patients with ‘true’ excess of the orbital fat, fat removal alone is inherently limited by what the procedure can achieve in patients with more advanced midcheek aging. When carried out well, removal of the fat would eliminate the eye bags. However, quite often this does not produce the refreshed look that patients are seeking. Figure 4. 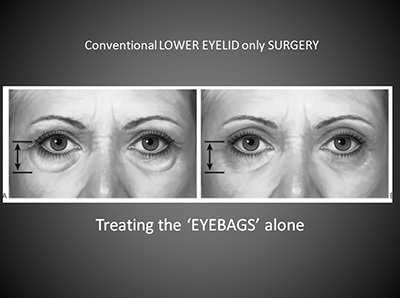 Removal of eyebag alone in patients with more advanced midcheek aging have the effect of hollowing out the orbits. This does not rejuvenate the midcheek but makes the person "old" from the hollowed out appearance. 1. The eye bags: This may be removed in cases of true excess or more commonly, the fat may need to be preserved but REDISTRIBUTED to move it from area where it is not wanted to that part of the cheek where VOLUME is deficient. 3. For patients with more significant loss of volume or deflation of the midcheek, these need to be restored. This can be achieved either by synthetic fillers (such as hyaluronic acids), cheek augmentation with implants or micro fat grafting, which is becoming increasingly popular. 2. In patients with significant aging changes wanting to achieve a fresh and rejuvenated appearance, a more advanced approach incorporating fat redistribution, midcheek lift and midcheek augmentation with fat grafting is currently the most powerful technique available.